Please check your sun, moon, and ascendant sign for a complete reading! This is a general reading for all of the 12 zodiac signs. Welcome to Gemini Season, and happy new moon! Aha! 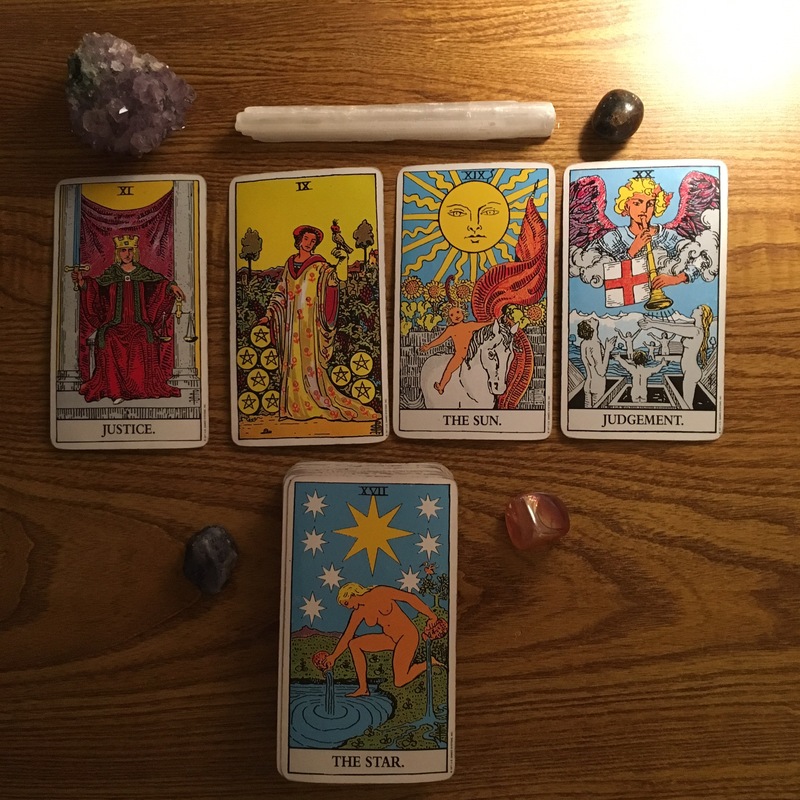 Finally, more positive and energetic cards are now presenting themselves to the collective. How does it feel, my friends? You made it out alive, and now summer is here, waiting for you to step into your own light, and more importantly, your truth. If there was ever a perfect time to have an attitude, Gemini season is it. The days where you allowed anyone or any situation suppress your ability to communicate who you are, are long gone. A spark of courage is now being ignited in all of you. Feel free to say exactly what you want, and communicate exactly what you feel the rest of this season. As if your life depends on it. When Justice AND Judgement appear together in a reading, expect karmic audits to start taking place. Have you really been living in your truth? Justice has no mercy for those who have been living with distasteful intentions or bad motives. When Justice serves as the first card, karma is working extra hard, and is in full effect. Whatever karma you’ve acquired recently will now find its way back to you. But if you have had integrity, and you’ve been living in your truth, justice is now going to be served in your favor. A situation that may have been stirring emotions inside of you and leaving you with a sense of confusion and a taste of unfairness, will now make sense to you. You will now understand why things happened exactly as they did. For better, or for worse. The 9 of Pentacles encourages us all to spark our kundalini energy, and get our mojo back! Know that you are powerful, you are wanted, and you not only have more than enough, but you are more than enough, beloved. Once you realize this, oh the joy that is on its way to you! The Sun reminds us that it is okay to have some fun, and nurture our inner child. Happiness is welcomed and available to all. Do you remember the things that truly make you happy? Do you remember the desires you had as a child before all of the social programming and karma dissected your inner voice? Listen closely, my friends. Happiness is one choice away. If you do choose it this season, know that it will be like no other happiness you’ve ever experienced. Judgement closing out the reading calls for all who are unawakened, uninspired, living not in their truth or integrity, to be shaken from their slumber. The dead shall rise from their graves, and a moment you have been waiting for is finally here. The Star as our energy card is potent and inspiring. I would now like to ask all of you to make a wish. What is the moment you have been waiting for? What would make you rise from the dead if you had the opportunity to experience it? The Star card is here to grant all of us unconditional self love, and new inspiration for our life, and ourselves. You are the star of your own movie. Regardless of what mistakes you have made, what time you have wasted, and whatever heartaches you’ve been trying to run away from or fight. The Universe is always FAIR. Karma will be sending out invoices to all who owe her, and she will be sending deposits to all she owes. I hope you have been living true to who you are. It will now start to pay off. Make a wish and surrender to all of your expectations. For once, let the universe surprise you. Magic is on its way. Like I said earlier, welcome to Gemini season, and may this mutable new moon bless you by being totally, and ultimately, in your divine favor. Please check your sun, moon, and rising sign for a complete reading! Following this post, they will be in order and color coordinated. Aries follows this post, and we end with Pisces. Aries will be red, and Pisces is Sea Green. Previous Leo: New Moon in Gemini Tarot reading, 2017. Your light has always mattered more. Leave all things blue behind you. Next Virgo: New Moon in Gemini Tarot reading, 2017. Let love in. You are allowed to feel peace!